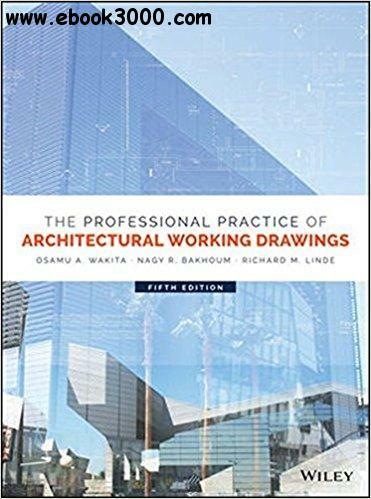 The Professional Practice of Architectural Working Drawings is a complete guide to the skills you need to create a set of drawings that clearly and effectively communicate your design. Covering everything from site, floor, framing, and foundation plans to building sections and elevations, this book presents crucial concepts and real-world techniques architects rely on every day. You'll learn the standards, customs, regulations, and symbols, alongside computer-generated drawings, 3D modeling, Building Information Modeling, and other architectural technology. This new fifth edition includes updated information on sustainability concepts, layering systems in line with AIA standards, deeper explorations of dimensioning, more sample ADA drawings, and a new selection of case studies that offer a real-world glimpse into how these topics relate to the architect's everyday work. Hundreds of drawings demonstrate important skills and concepts, and online ancillary materials offer a robust set of resources to students and instructors. Architectural drawings must be precise, accurate, and complete; they must follow certain standards that make them universally understood in the proper context. This book teaches you how to produce professional-level drawings that leave no room for questions or confusion. Architects use drawings as a second language, to effectively communicate ideas to clients, contractors, builders, and other design professionals throughout all stages of the project. The Professional Practice of Architectural Working Drawings teaches you how to become fluent in the visual language of architecture, to communicate more effectively with all project stakeholders.